In an effort to provide disadvantaged Long Island school children with the tools they need to succeed in the coming year, Meyer, Suozzi, English & Klein, P.C. filled over 80 backpacks and raised more than $800 as part of UJA-Federation of New York’s 14th Annual Supplies for Success backpack drive. Created 14 years ago by Mindy Richenstein, and organized by UJA-Federation, Supplies for Success fills backpacks with school supplies for underprivileged children to be distributed through UJA-Federation’s beneficiary agencies, schools, and other local organizations. The program has grown from serving 68 children in its first year to more than 7,000 children last year. This September, UJA-Federation hopes to give backpacks to more children in need than in prior years, and Meyer Suozzi is proud to be a part of the initiative. 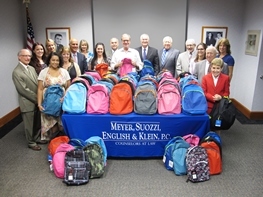 With such a large number of attorneys and staff participating in the campaign, Meyer Suozzi hopes to raise enough contributions to fill 100 backpacks (or more!) next year.